After a long break from baking (sorry!) I'm back with an amazing cake different than other. Something between cheesecake and regular cake. Quite heavy but velvety and smooth inside with gentle hint of lemon zest. If you like marzipan you will enjoy that aromatic cake that is packed with sweet flavour of almonds. Extremely easy to make with a short list of ingredients doesn't take much time to bake. The cake is very moist and tastes much better the next day. Using electric mixer beat egg yolks with xylitol, add ricotta, vanilla extract, lemon zest and ground almond and briefly mix to combine the mixture. Whisk the egg whites until soft peaks. Fold 1/3 of the egg whites into ricotta mixture to loosen and then fold in the rest. Spread the mixture in the tin, sprinkle the almond flakes on the top and bake for about 50 minutes. Cool it down and refrigerate it overnight. Dust with powdered xylitol before serving. Can you convert to cups and ounces? You forgot to add in the lemon zest in recipe directions. Thanks for the blog and all your efforts at baking. I am so happy I found your blog. It is so hard to find low-carb diabetic friendly recipes that actually taste good and are healthy. Long may you continue this blog. Sorry, do you know if I can add raspberries to this cake? 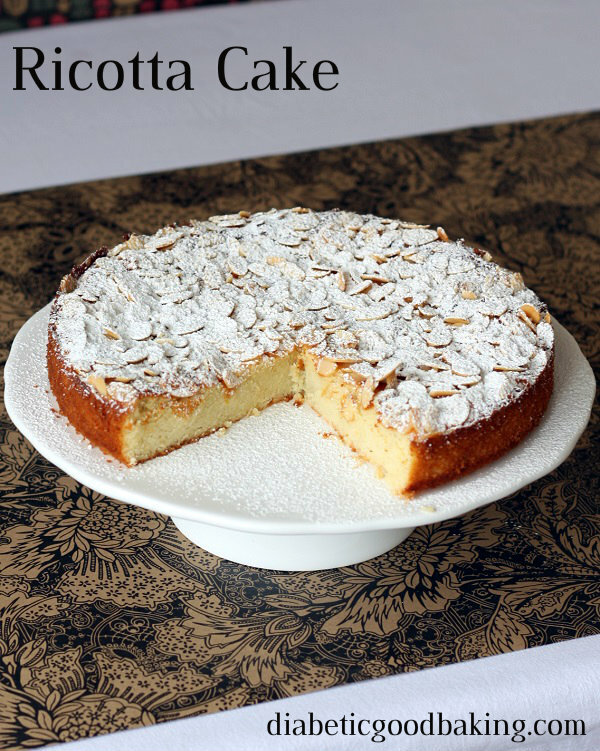 could I make this cake with mascarpone instead of ricotta?